The second printing features new items like wooden authority stars, extra commodity and resource tokens, updated recruit cards, and a quick-reference guide. 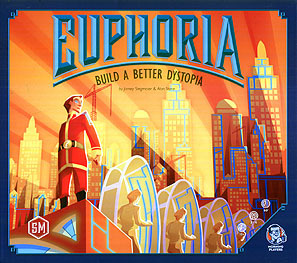 Euphoria is a worker placement game where dice are your workers. The number on the die represents that workers knowledge, which you will compare to the knowledge of other players workers throughout the game. The more you send you workers throughout the city and the more workers you add, the more they discover about their twisted society. If they learn too much, they might desert your cause. You also have a few elite recruits at your disposal: one who has pledged allegiance to you, and the other who has yet to convinced. You can inspire and use that recruit by reaching certain milestones in the game... or by letting other players unwittingly reach those milestones for you. Your path to victory is paved with the sweat of your workers, the strength of your allegiances, and the tunnels you dig to infiltrate other areas of the world, but the destination is a land grab in the form of area control. You accomplish this by constructing markets that impose harsh restrictions of personal freedoms upon other players, changing the face of the game and opening new paths to victory. You can also focus on gathering artefacts from the old world, objects of leisure that are extremely rare in this utilitarian society. The dystopian elite covert these artefacts - especially matching pairs - and are willing to give you tracts of land in exchange for them. Four distinct societies, each of them waiting for you to rewrite history. What are you willing to sacrifice to build a better dystopia? Ignorance is bliss, get those oppressed masses working and keep them drugged up. First impressions: There seems a lot going on but it's not too much. Some lovely components. First Play: A mix of luck and strategy that plays well without being overwhelming. Your in game priorities will shift as resources become both more and less important and you have to make sure to keep your workers drugged up so that they work hard. Even after one play I was glad I'd bought this. Later plays: Looking forward to my next game.